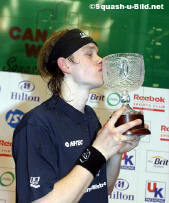 James Willstrop became the inaugural Canary Wharf Classic Champion, beating Thierry Lincou 4-2 in the best of seven final, 9/7, 9/5, 5/9, 9/4, 9/10, 9/2 in 87 minutes. Willstrop took a 2-0 lead, and for a while it looked like the Frenchman's earlier exertions might have taken their toll. But Lincou fought back to take the third, then received a couple of calls from the referee he wasn't happy with as Willstrop took the next to lead 3-1. "Willstrop leads 3-1 ..." was the historic call that started the fifth game in this first-ever best of seven final, with Willstrop eventually winning 4-2. “Super Squash”…. “Not bad at all”… “How did he do that?”… “What was that?”…. The vox pops were unanimous. Both players gave us some pretty wonderful squash. But James Willstrop was playing that much better. Thierry put too many drop shots in the tin. James’ game was solid, simple and structured. Both of them went for lengths, precision and technique, and each added each their flair for attacks, their patience, their intelligence of the game. The crowd was behind James, that was to be expected, but actually was much more divided than it was on Thierry’s game against Ong Beng Hee. I could hear quite a few English accents “Come on Thierrrrrrrry”, “Come on Frenchie” (bless them). And Lincou did win the crowd over when in the 5th game (James leading 3/1, sounds weird, I know), he played 3 backhand drives that literally slowed down and stuck to the wall. In all the matches I saw in my life, I never ever saw such precision. He did 2 in a row, and just to make it complete, did another one a few shots later. The crowd, all connoisseurs, were absolutely gobsmacked and a thunder of applause saluted the end of the rally. Unfortunately, I have to say I was far from being impressed by the Referee. In my opinion, and it’s only my opinion, he had a bad day. It went to the point where it did look like he was biased, and I refused to believe that. You know, Thierry is not the kind of player who asks for lets for no reason, and he was refused so many it became ridiculous. Not to mention some 'strokes' that not only were not awarded, but not even a let was given. Mind you, he did the same towards James twice: two strokes awarded to Thierry where honestly it should have been only a let. No, sorry, Ref, not a good match indeed for you today. The 5th game was long and high in emotions (and ref mistakes). Thierry eventually won it very rightly indeed 10/9, but it went Deuce, Adv James, Deuce, Adv Thierry, Let, Deuce, Let, Adv James, Let Let, Deuce, Adv Thierry and finally game Thierry. The last game was just awesome. “I did 3 or 4 flicks that really took him by surprise”, James told me after the game. “I flicked him from left to right, and from right to left. I got in front of him, and when you succeed in getting in that position, it gets very difficult for your opponent to get to the ball”. James won, and in such a brilliant fashion. He was up 8/1, and won the 6th and last game 9/2. So, one event gone, another one already started. 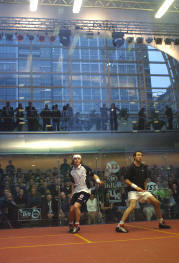 I’m now off to Esporta Croydon, to see some more squash. PS. Thank you very much for taking the time to read my reports, people, very much appreciated. Peter Nicol is the perfect Ambassador for the game of squash. So many times I’ve seen him going to Charity Events. He doesn’t stop. Tonight, it was for the Raynaud's & Scleroderma Association, the disease from which Peter’s mother died 12 years ago. So before the final, several pieces were auctioned, raising nearly £3000. Star item was a rugby ball signed by Martin Johnson and George Gregan, captains of the teams the 2004 Rugby World Cup Final [which England won ... Ed], which alone got £1,750! 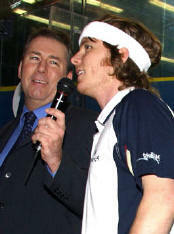 “And you can quote me on that one!”, said Peter Nicol after the last game while talking to Sir McKenzie and myself. When I mentioned that we were the ONLY SPORT where the score changes for every event, time of the month, or weather conditions, the Boss concluded. “We should only have scoring up to 9. The professionals would play in a PAR system with deuce/advantage, and the non pro would play 'Standard' scoring. Therefore, the score would always appear to be the same”. Sorry, PSA, but this is the first time in a looooooooong time that I've heard a sensible solution. It’s with those words that the Boss, a very smiling Peter Nicol, started the evening. Alan Thatcher, co-promoter and compere of the event, then commented on the funny side of things, as here we had a Scottish player that was now playing for England, and an Australian now playing for Scotland! You have to admit that it is surprising. “Let’s put the English in their place” concluded John White, to the delight of the crowd. “Hear hear!” I was bold enough to add loudly. The next 59 minutes were not a real match, but a wonderful exhibition of skills and shots and hits and rallies from hell. The instructions were I’m sure “We don’t asks for lets, we play everything”, as those two just went for everything. Imagine what happens when you say to a player like John White, “go for every shot”! Already, when supposed to behave himself, he hits everything in sight… Believe me, whatever those guys are getting paid, it’s not enough! 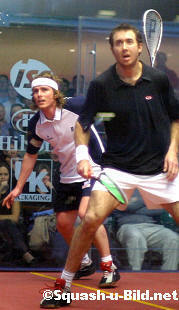 White attacked the ball every shot he made, and Peter retrieved as if his reputation was at stake. After the 1st game, won by Peter Nicol 9/6, Alan Thatcher asked John White what was his game plan for the next one. “No idea” exclaimed the tall Scot! And when the compere asked a spectator what advice he would give Peter, a voice in the crowd shouted “Get a hair cut!”. As you can see, the atmosphere was aggressive and blood was about to be drawn! In the second, Peter asked for a let. “No let” barked the referee. Both players opened the door and stood there, pretending to be mad. “I could have got to the ball, ref” said Peter. “He couldn’t get to the ball, he couldn’t even see it!” retorted John. “He hit a drop shot, I hit a boast, and he took a taxi!” No let, thank you” concluded the referee. Then, Peter asked another for let as it was obvious that he slightly touched John with his racket while playing a left side boast. He started an explanation, that the ref couldn’t hear, so he was about to explain it again, and then stopped and just smiled “oh just forget it!”. Big John won the second 9/4. “Well, not bad for somebody who didn’t have a game plan”, laughed Thatcher. “I’d better stick to it then” said John, “it seems to work!”. In the 3rd game, won by John 10/9, Peter pretended to argue that one of his shots was not up, and stood still. So John went to him while Peter was still arguing with the Ref, took Peter’s racket, slid it the other side of the court, where Peter should have stood to receive his serve, then as Peter was still talking, took him by the hand and took it where the racket was. It was not a sad moment, let me tell you. The 4th was outrageously John’s, even if it’s Peter who eventually won it 10/9. Triple wall boast? You want them, here they are; volley kills, nicks, attacks, drives and crosscourts. That cannon speed-gun thing couldn’t have detected half of them, and yet Peter was retrieving, retrieving, and retrieving. It was beautiful. Funny yes, but beautiful. After a rally that last forever, John started slowing down the shots, and so did Peter, and I swear that for a few minutes, I had the impression that both players were playing in slow motion. It was actually an impressive display of technical skills. The ball seemed to float, slowed down, the lobs, the drives… Amazing. At Deuce, Peter serving, John pointed at the line to indicate to the marker that Peter’s lob serve might have been out, and looked in the direction of the 2 refs. Nothing to smile about apparently, apart from the fact that he went on doing it for the whole rally! As Peter won it, John started a discussion with the ref, who tried to say something about yellow line, side wall, serve bla, bla, bla. Peter seemed baffled (we all were) and said “What are you, what do you, are you confused? I’m confused!” It was hysterical! But the best was still to come. First, for those who read my previous reports at the Nationals and the Inter Counties, you know that I’m a ball magnet. Well, in the last game again, the ball flew out of the court, and it landed at my feet. And then, during the interval, Linda Davie (the cheeky Scottish tournament referee) came and gave Ellery Hanley a rugby ball that the League legend hid under his seat. Something was up. At 4/6 on John’s serve, Hanley threw the rugby ball onto the court. Immediately, the two players dropped their rackets, and started fooling around with the ball. John then asked his coach to come and join them. “Peter is going to stand there, I’m going to throw him the ball, and you’re going to go through him” ordered John to the strong man. And he did! He tackled Peter, and pinned him on the floor. Do I dare? Of course I do…. SOME GET ALL THE LUCK! And please, please Mrs Hanley, I AM JOKING. “No, no, you didn’t do it properly, do it again!” added John White. The match ended not long after this by a logical victory for Peter. I think, and it’s only my opinion, that as a mark of respect for the promoter, John wanted Peter to get the last point. I may be wrong, but I’ll stand with my opinion. Only one not so pleasant thing - the smell of grilled fish for about five minutes each evening while watching the games. Good idea to have some food for the Sponsors up in the Gods, but next time, try and avoid fish please…. Already, because the Canary Wharf Classic is a great success. Spectator-wise, Show-wise, Organisation-wise, Network-Marketing-wise. It is such an honour to be part of it, and I feel very privileged to be here. One, because I’m watching some amazing squash, and two, because I’m able to do a job I love doing. It’s such a shame I have nothing nasty to report, you know, a player behaving badly, bad marking, well, something baaaad. No, not this time. But it will come, do not fear…. Do you know how close it was between Thierry Lincou and Peter Nicol to get to the final? In the Jubilee Place Group, the 3 players had 2 victories each, so they couldn't go on head-to-head (it was one win each). As usual, a word about the referees. No incident to report, a bit of discussion here and there, but nothing worth mentioning. So, just a list of names that you already know, and who have been doing a very professional job. Also, two people that are worth mentioning. Two volunteers, one who is coming from far away just to help out and drive the company van and the players back and forth, John Whitfield, who is normally in the Sport Goods business. And Ken Narain, from Ilford, that most of the players and spectators know as “the towel and door man”. You know, the one who gets the floor dry for the players, and opens and closes the glass door, who is actually a masseur for many of the pros, like Peter Nicol. “Sir” McKenzie, Mr Squash Player, is actually coming to watch the finals tonight, so, rejoice, the Master may report, and I can relax [Oh no, you can't, Ed] and enjoy the squash. At last (you thought I'd forgotten, didn't you), because I would like to be able to have a normal night, instead of finishing at 1.30 and starting at 5.30. Why, you may ask? Because there are two of us working on these reports I’m writing. And if you think that my English is not that good (and you are soooo right, but I can’t wait to hear your French…), you don’t know what they look like before Steve Cubbins amends them! Yes, Steve is always on stand by. He patiently waits near his phone to hear from me as soon as the match finishes. He stays up late to get the reports I have had the time to finish before going to bed, and wakes up as early as I to get the ones I send him before he goes to work. And when there are events at weekends like Inter Counties, or Wimbledon Cup, or Esporta tomorrow and Sunday, he stays near his computer to get all the reports on line. So, there again, team work. Nothing gets done if you’re doing it alone. Like for the players, like for organising an event, you need a team.